NeedlePaint.com will still be working through the holiday, but we won’t be answering emails or the phone next week (Dec. 31 – Jan 4). Orders placed between now and then will ship the week of the 7th, and if we have any questions about your order we will get in touch on Monday the 7th. Happy stitching and wish you a happy and healthy New Year! My wife was inspired last year by the “war and peace” stocking Peggy stitched for her granddaughter last year. 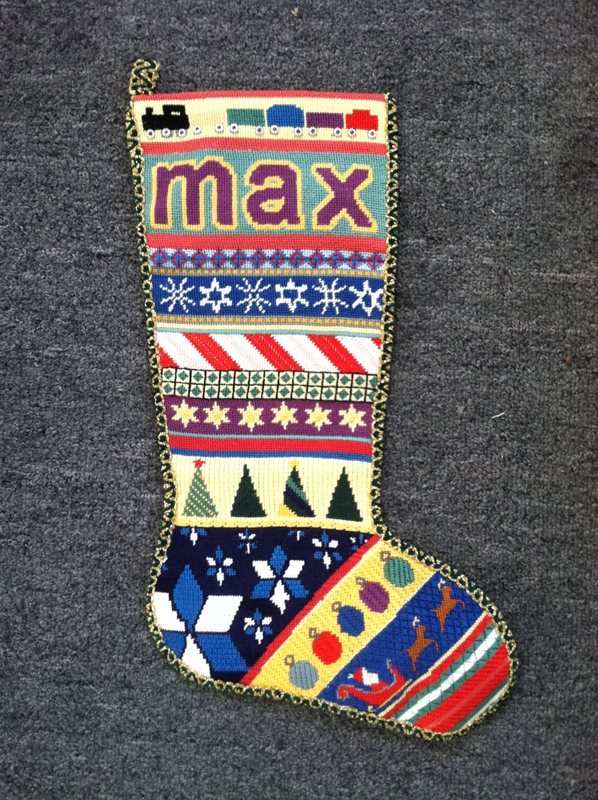 After seeing it, she decided she wanted to make our nephew his own needlepoint stocking. Not being a very experience needlepointer, I’ve been impressed. At Peggy’s suggestion, we bought the NeedlePoint Book by Jo Ippolito Christensen, and really had a good time with it. Rather than doing all tent stitches, she found it a lot more enjoyable to follow Peggy’s lead, and do most of the sections in different stitches. As time went on, she got better an better, and now with another addition to the family this year, I’ll have to start thinking of a new needlepoint design to make on NeedlePaint! This week we had a request. 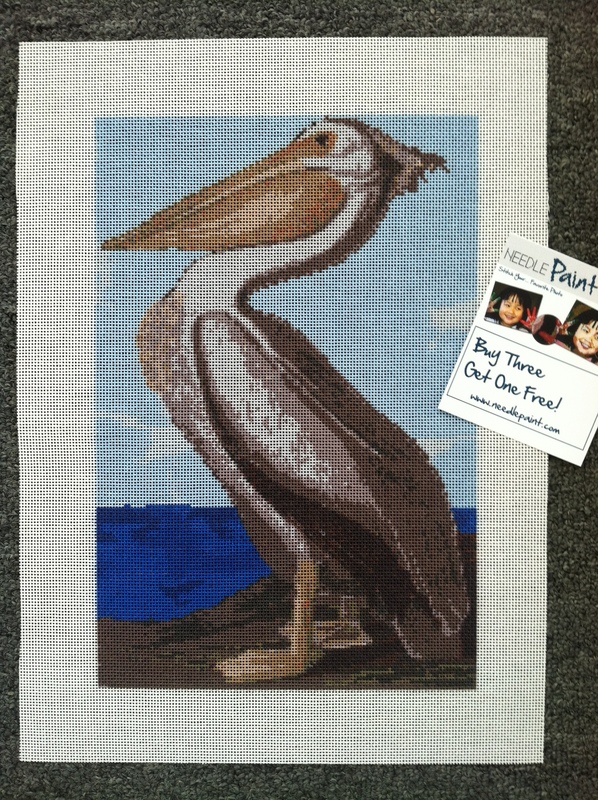 Our customer loves the Audubon White Pelican needlepoint canvas we have on our Ebay Shop, but wanted a lighter more fun background. We decided to change the background to show the it standing on a rock, by the edge of the ocean. It really turned out well! If you ever have an idea for a needlepoint kit, that you can’t find anywhere, we’d be happy to help! I was looking at Janet Perry’s fantastic website, nuts about needlepoint, today and came across one of the best looking projects I’ve seen in months! 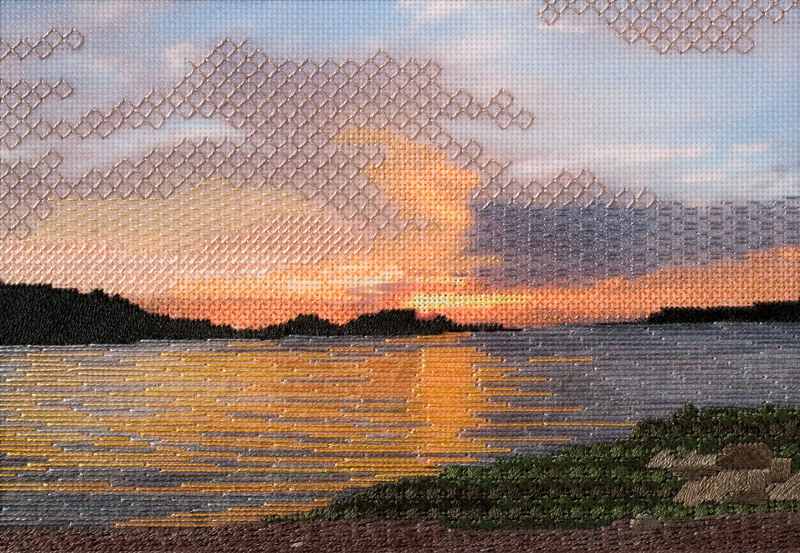 The Naoshima Sunset was stitched by Lois Kershner and she won a prize at one of the ANG seminars last year for this! This is custom needlepoint at it’s best. The background is congress cloth, which was then stitched using light stitches and exposed canvas to achieve this effect. If you have every wanted to needlepoint a photo, we’d be happy to help. We specialize in making custom needlepoint canvases, and we use: (mono) 10, 12, 14, 18, interlock 14, and congress cloth. You can preview the design on our website www.NeedlePaint.com I also see potential with cross stitch here with exposed canvas. But, if you can take a class from Lois, she’ll teach you new techniques to use! 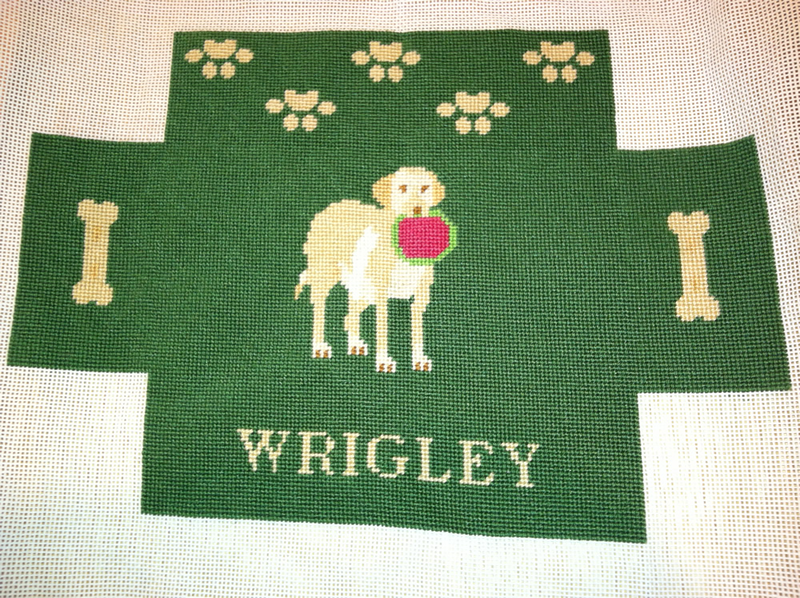 You can see here needlepoint class schedule for 2013 here. New Fleur De Lis Needleopint Belt Patterns! I was flipping through some magazines last weekend and came across a beautiful tie for men. The idea was simple and classic, but with a modern twist. A violet background leaning towards red, with a bright pink fleur de lis repeating up the tie every once in a while. The idea is so simple, it really is the colors that make this needlepoint design special. 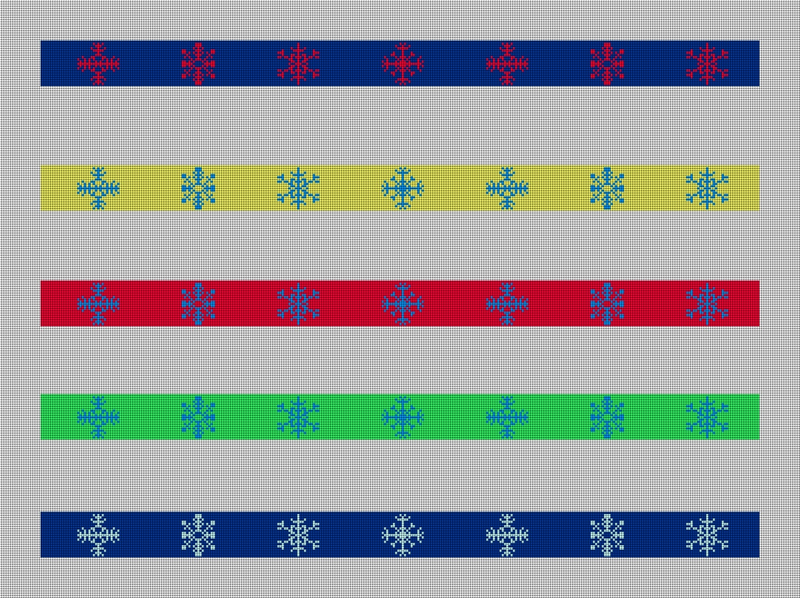 So I figured why not design our own fluer de lis needlepoint belts. Why not standout this year with your own custom needlepoint belt! 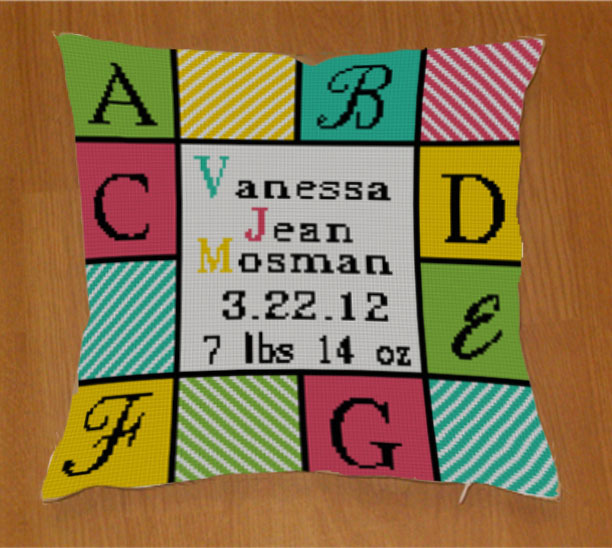 We can adjust to any color you like, add a monogram, words, or really anything you’d like to see. Each belt is made to order, so we’ll fit the size to you! 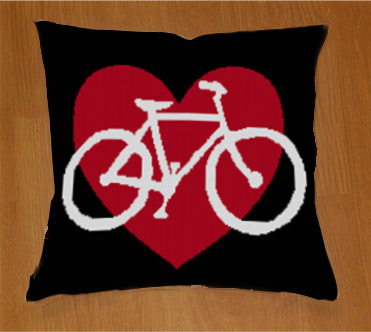 New Needlepoint Kits for Bike Lovers! Our newest design here at Needlepaint is out and ready for stitching. This new kit is for the cyclist in your life. 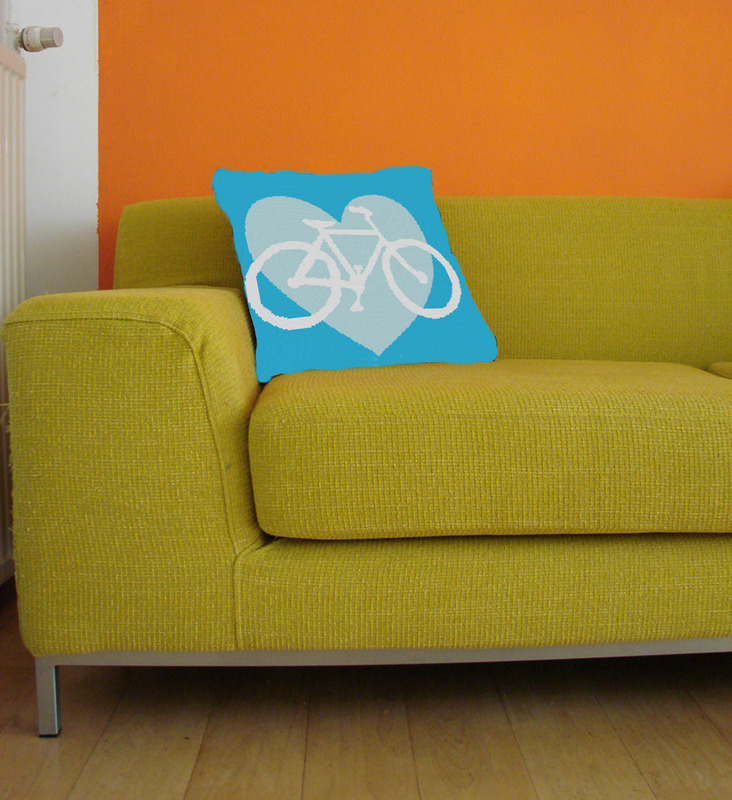 Spread the bike love with this pillow accenting your sofa or chair. We can do it in any color to fit in with your decor. 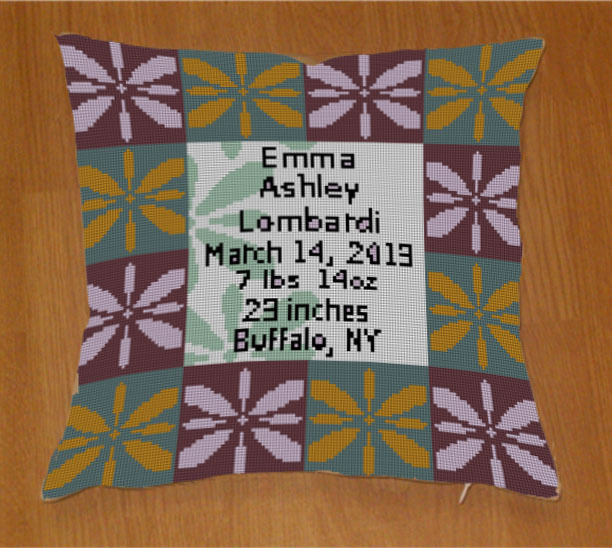 Above is an example of a colorway that can be used for this needlepoint pillow. Let us know your color choices and we’ll send you the canvas and thread to make it happen. Check out the funky room below! We worked on this project with our customer, it was a pretty simple request, but sometimes the simple projects are the best! If you to create your own custom needlepoint kit, go to www.NeeldePaint.com or contact us directly for assistance. New Pink Lady Bug canvas! We are excited about our new baby needlepoint canvases. We have been working hard to create lots of new designs that will work for any nursery. 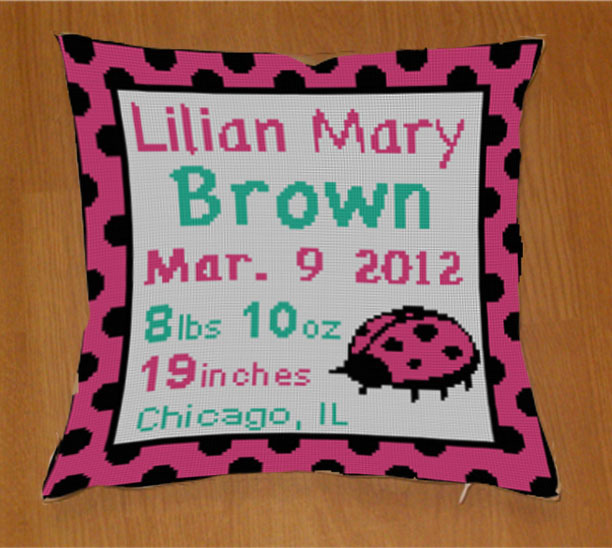 Take your pick from our pink ladybug baby pillow to a simple plaid for a little man, visit our site and pick from various colors and canvasses. Like always all of our designs can be personalized to your liking and baby’s style. So just choose your color and specify your custom text. 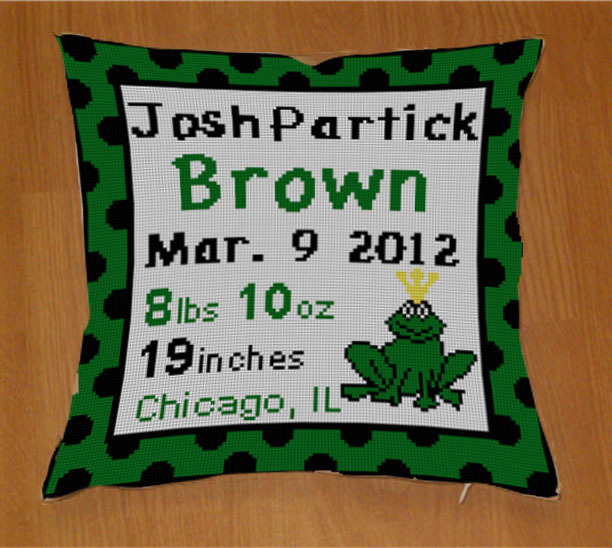 This Frog needlepoint canvas is adorable to celebrate the birth of your little prince! New Coventry birth announcement canvas! We have this one in different colors to match your nursery or the season.